Chris Rao, owner of Sound Wave Entertainment, is a native of Vienna, VA. Chris grew up loving music, creating mixes and spinning tunes since he was a kid. In college at Marshall University, he was a DJ at the college radio station as well as a favorite house party DJ. 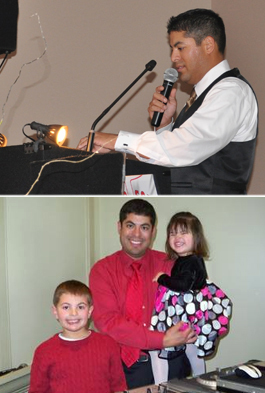 After college, Chris began to delight clients by entertaining many successful wedding receptions and private parties. Chris followed his passion and went on to run Sound Wave Entertainment. He is dedicated to customer service and goes out of his way to meet each client's every need by delivering a successful event with a thoroughly entertained crowd. Look for Chris, Sound Wave MC, to guest star at McCormick and Schmick's in Reston, VA on a surprise Saturday or at an area wedding or private party nearly every weekend of the year.